The ionizing Lyman continuum flux escaping from high-redshift galaxies into the intergalactic medium is a fundamental quantity to understand the physical processes involved in the reionization epoch. However, from an observational point of view, direct detections of HI ionizing photons at high redshifts are feasible for galaxies mainly in the interval z ~ 3−4. We have investigated a sample of star-forming galaxies at z ~ 3.3 to search for possible detections of Lyman continuum ionizing photons escaping from galaxy halos. We used deep ultraviolet (UV) imaging in the COSMOS field, obtained with the prime focus camera LBC at the LBT telescope, along with a catalogue of spectroscopic redshifts obtained by the VIMOS Ultra Deep Survey (VUDS) to build a sample of 45 galaxies at z ~ 3.3 with L> 0.5 L∗. We obtained deep LBC images of galaxies with spectroscopic redshifts in the interval 3.27 <z< 3.40 both in the R– and deep U-bands (magnitude limit U ~ 29.7 at S/N = 1). At these redshifts, the R-band samples the non-ionizing 1500 Å rest-frame luminosity and the U-band samples the rest-frame spectral region just short-ward of the Lyman edge at 912 Å. Their flux ratio is related to the ionizing escape fraction after statistical removal of the absorption by the intergalactic medium along the line of sight. A subsample of ten galaxies apparently shows escape fractions >28%, but a detailed analysis of their properties reveals that, with the exception of two marginal detections (S/N ~ 2) in the U-band, all the other eight galaxies are most likely contaminated by the UV flux of low-redshift interlopers located close (in angular position) to the high-z targets. The average escape fraction derived from the stacking of the cleaned sample was constrained to fescrel < 2%. The implied hydrogen photoionization rate is a factor two lower than that needed to keep the intergalactic medium ionized at z ~ 3, as observed in the Lyman-α forest of high-z quasar spectra or by the proximity effect. Measured values and upper limits at 1σ for the LyC relative escape fraction of galaxies at z ~ 3.3 in the COSMOS field. Black descending arrows show the upper limits associated with individual galaxies, while the cyan arrow is the limit derived in Boutsia et al. (2011) by stacking 11 galaxies. The red arrow is the limit derived using only relatively bright galaxies with R ≤ 24.5, corresponding roughly to L ≥ 1.2L∗ (M1500 ≤ −21.2). The blue arrow shows the upper limit for fainter galaxies (stack of 26 objects), while the magenta arrow indicates the upper limit for the whole sample (stack of 37 galaxies). The magenta dashed line is the expected for a limit in the U-band of 29.7 mag (at S/N = 1, assuming an intrinsic ratio L1500/L900 = 3 and a mean IGM transmission of 0.28). 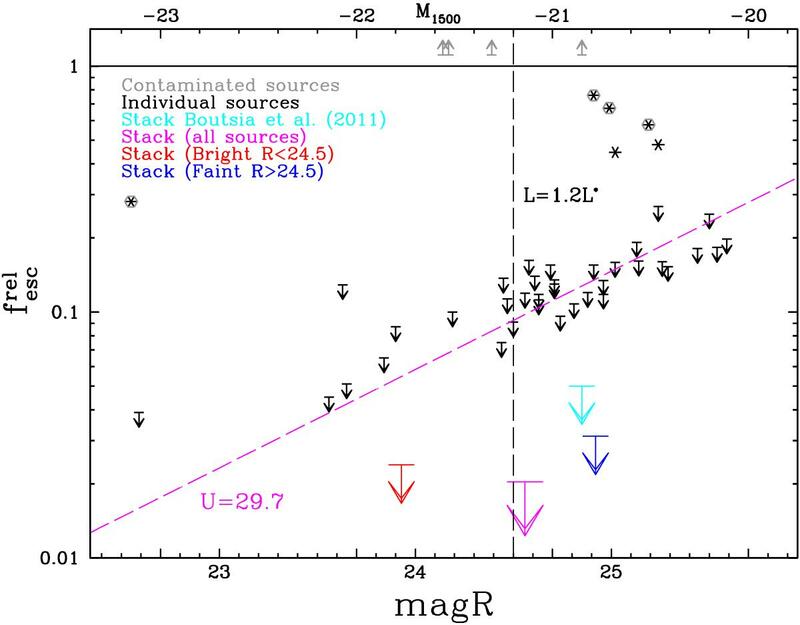 This shows that the trend in larger escape fractions with fainter R-band magnitudes is due to the depth of the LBC image in the U-band, and it is probably not due to a physical trend in the population of star-forming galaxies. Asterisks show the galaxies with detection in the U-band and a significant LyC emission. The grey hexagons and the upper arrows indicate likely foreground contamination, where the global or the local escape fractions exceed 100%. Only two sources (ID = 25155 and ID = 63327, black asterisks without the grey hexagons) are examples of possible LyC emitters. These results support a scenario where high redshift, relatively bright (L ≥ 0.5L∗) star-forming galaxies alone are unable to sustain the level of ionization observed in the cosmic intergalactic medium at z ~ 3. Star-forming galaxies at higher redshift and at fainter luminosities (L ≪ L∗) can only be major contributors to the reionization of the Universe if their physical properties are subject to rapid changes from z ~ 3 to z ~ 6–10. Alternatively, ionizing sources could be discovered looking for fainter sources among the active galactic nuclei population at high redshift.